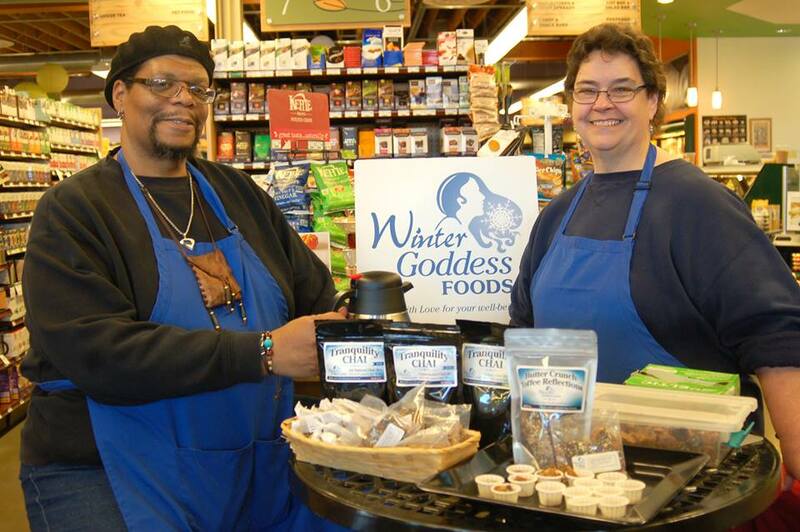 Winter Goddess Foods: Plant Medicine: Eucalyptus: The Wonder from Down Under! Plant Medicine: Eucalyptus: The Wonder from Down Under! In my final installment about herbs and plants that are especially beneficial during cold and flu season, I would be remiss if I didn't bring up one of the most tried and true and most used remedies in the world; fragrant and refreshing Eucalyptus. Native to Australia, Eucalyptus is related to the Tea tree, and is one of the fastest growing and tallest trees in the world. 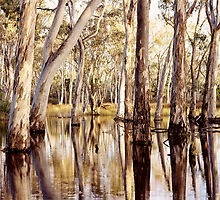 In fact, Eucalyptus can grow as tall as 300 - 480 feet tall. The name Eucalyptus means “well covered” which refers to the cap that cover the flower of the tree before it buds. 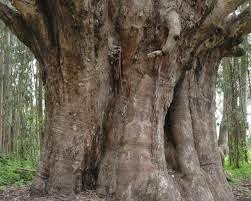 As trees go, it is a huge water lover, and enjoys living in hilly terrain as well as damp marshy valleys, extending its very large and extensive root system deep into the soil. 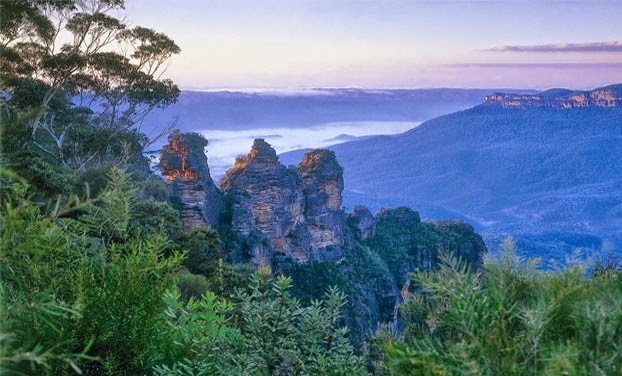 It makes up about 75% of Australia's flora, and is especially abundant in the Blue Mountains region; so named because of the blue tinge the hovers over the entire area, caused by light reflecting from the fragrant organic gasses emitted by these trees. Eucalyptus was revered by the Aboriginal Gundungurra and Darug peoples, used not only as a natural cure for fungal infections, skin wounds and a wide range of other illnesses and conditions, but as building material, fuel, and a natural wind break. 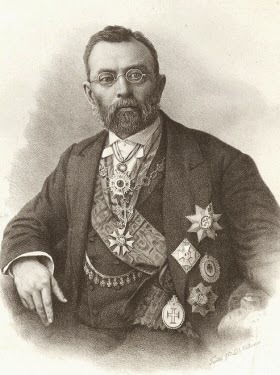 German born botanist and explorer Baron Ferdinand Von Muller after extensive study decided that the oil of the tree contained more antiseptic properties than the Cajeput oil used at the time. As director of the Melbourne Botanic Gardens he embarked on a quest to promote this discovery to the world, and succeeded in introducing Eucalyptus trees in southern Europe, North and South Africa, California and extreme tropical areas of South America. 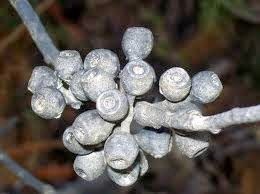 In 1855 the French government planted the fast growing trees in Algeria during the Malaria outbreak, hoping that its aromatic properties would ward off the noxious gasses thought to trigger the disease. It worked, but not because of the essential oils it contained, but rather because of its water hungry nature, the trees eradicated the habitat of the mosquitoes which transmitted the disease. Though Van Muller publicized Eucalyptus oil as an antiseptic, it was first distilled back in 1788 by Dr. John White and Dr. Dennis Cossiden, who used the fragrant oil to treat disorders in the chest. Eventually it was prescribed for all respiratory conditions including asthma, bronchitis, coughs and the flu. 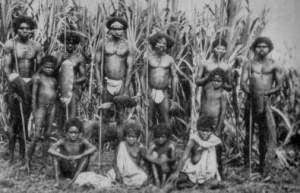 Over time, most families in Europe were using the oil and leaves to treat not only respiratory ailments but fever, skin problems, burns, ulcers and wounds. While there are over 400 different varieties (all with different variations of scents), Eucalyptus Globulus (also known as Blue Gum or Tasmanian Blue) is the main source of the Eucalyptus oil produced throughout the world, with the more significant producers including South Africa, Portugal, Spain, Chile, Swaziland and of course Australia. However, pharmaceutical grade oil must have a minimum cineole (the active ingredient eucalyptol) content of 70%. This strength is also used in very small quantity in commercial food preparation for flavoring. Two other varieties Eucaluptus kochii and Eucalyptus polybractea have the highest cineole content between 80-95%. Some producers of lower grade oils use a method called rectification (multiple distilling) to raise their oils up to the higher standard. In today’s world, Eucalyptus is especially revered by aromatherapists and homeopaths due to its multiplicity of effects and uses. Eucalyptus acts as an analgesic, antiviral, antiseptic, deodorant, expectorant and contains anti parasitic properties as well. It is also frequently used as an ingredient in chest rubs, antiseptics, nasal decongestants, cough remedies, and in muscle and joint ointments. For your own personal or household use it can be used very easily in several ways. For cold and flu: add several drops of Eucalyptus oil into a humidifier, vaporizer, or in a pot of boiled water removed from heat. Breathe the steam deeply. 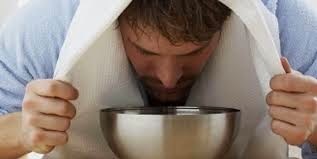 This will allow for freer breathing as it relieves both nasal and lung congestion. It also kills germs and helps to boost the immune system. The oil can also be rubbed on the chest, back, throat, temples and on the reflex points of the feet (cover with socks). Added to distilled water and “spritzed” on the body Eucalyptus oil can grant cooling relief for anyone suffering from fever (or for anyone during a hot day). Skin support: Add several drops to your bath or wash water. This helps to relieve skin eruptions and oily complexions. A few drops of oil on a cloth or compress dabbed on the skin can help treat eruptions from acne, herpes and chicken pox. For wounds, boils and insect bites: Mix with an equal amount of Apple Cider Vinegar and dab on problem areas. Deodorizer: Fill a spray bottle with distilled water. Add several drops of oil. Spray into the air. In Europe and elsewhere, due to its stimulating properties, this mixture was sprayed within meeting halls before and between sessions of important meetings and discussions to "clear the air." 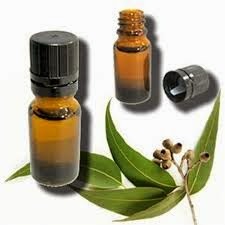 This gave rise to the belief that eucalyptus oil can cleanse the air of negativity. For sore muscles and joints: Massage several drops of oil on the affected area. As a natural analgesic, Eucalyptus can act as a liniment to relieve rheumatic, arthritic and other types of pain. It's perfect for sports medicine use on athletes as well. As a delouser: Oddly enough, one of the benefits of Eucalyptus since it is a relative of Tea Tree, is that it is a very potent lice fighter. It can be used in the same way as a substitute for Tea Tree oil. I have included the recipe for a natural head lice treatment here. A natural “Pick-me-up”: Place several drops of oil on the collar of your shirt if you like, or on a cloth, and carry it with you, sniffing it throughout the day. 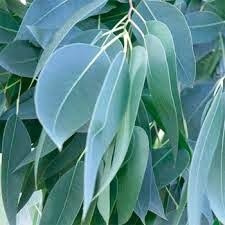 Eucalyptus has a stimulating effect on the nervous system and has been shown to increase brain wave activity. As such it can counter both physical and mental fatigue, as well as adding support for folks battling depression or lethargy. It is also perfect for study time at school or while working on projects. ***There are a myriad of ways that Eucalyptus can be used, but as with all plant and herb remedies, caution should be applied before using it. First of all, always search for and use the highest grade of oil. If you suspect that you may have sensitive skin, use Eucalyptus oil with a carrier oil like coconut oil, or in a gentle cream or lotion before rubbing on the skin. If you are unsure, do a spot test on a small area first, to see how your skin may react. Eucalyptus oil should never be used during an asthma attack! It should also never be used on infants, and should only be used on young children under the advice of a health care professional. As it can be highly toxic when taken internally, it is not advised unless approved and guided by a healthcare professional. There are so many other uses of this wonderful bit of Plant Medicine, that space would not allow it all. Search the internet and do your own research, and you will be amazed to find even more natural cures and benefits are available to you, compliments of the Wonder from down under.